The flirtation and sexual tension between Batman and Catwoman are well documented and encompass the comics, TV, films, and animated shows. My earliest exposure to their relationship was when I watched the 1960s pairing of Adam West and Julie Newmar. 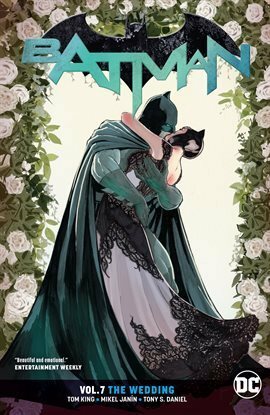 When DC was building up this latest Batman/Catwoman romantic storyline, I knew that it wouldn�t end in a happily-ever-after, but Tom King and the other writers and artists who worked on this story built something with a strong emotional punch and added interesting nuances to these beloved characters. In BATMAN VOL. 6: BRIDE OR BURGLAR, readers saw a different and more human side to two comic book legends, leaving their story on an optimistic note. The end result, covered in BATMAN VOL. 7: THE WEDDING, BATMAN/CATWOMAN: THE WEDDING ALBUM, and BATMAN: PRELUDES TO THE WEDDING, is something to wonder over and scream into the void at the unfairness of it all. Even though this entire arc is focused on Batman and Catwoman and their alter egos Bruce Wayne and Selina Kyle, the reactions from assorted bad guys and good guys are pure gold. Through the years, one of the most constant relationships is the volatile one between Batman and his nemesis Joker.BATMAN: PRELUDES TO THE WEDDING opens with the Joker waiting for an invitation to his archenemy�s wedding and Clay Mann draws him with all the malevolent mischief you�d hope the Joker to exude. 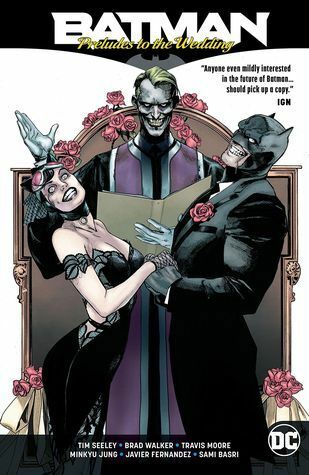 Through each story in�BATMAN: PRELUDES TO THE WEDDING, the Joker is a sort of Maleficent from SLEEPING BEAUTY haunting the upcoming wedding and those affected by it. 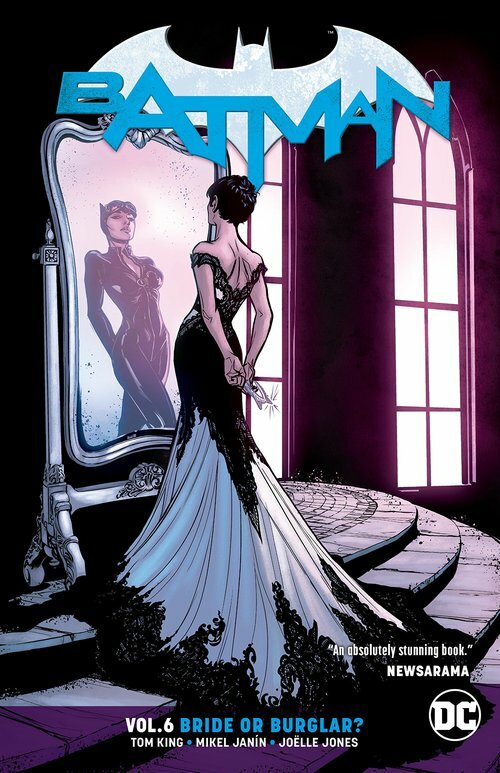 These stories, written primarily by Tim Seeley, are some of my favorite of this Batman/Catwoman wedding story. Different members of the �Bat family� battle different foes as well as their own personal demons, leading up to the final story featuring a violent, but uncharacteristically honest and sweet (for them), moment between the Joker and Harley Quinn. All of these minor battles are entertaining, but my favorite is perhaps Nightwing�s bachelor party-gone-wrong encounter with Hush. As a Joker and Harley Quinn fan, it goes without saying that I adored �Till Death Do Us Part�. In this final story, Harley is like the Harley written by Amanda Conner and Jimmy Palmiotti that I love so much � goofy, deadly, and in no mood to put up with the Joker�s bs. Although the Joker usually delights in mind games, in this short interlude with his former best girl, I feel like he throws in a kernel of truth along with all the rest. That he opts to not kill her when he can � something he only does with Batman � creates a slightly poignant moment from a psychopath. BATMAN VOL. 7: THE WEDDING�opens with an alternate reality story with the character Booster Gold. I had never heard of Booster Gold before reading this book, so I had no preconceived notions about whether he was looking to cause mischief or bring glad tidings as an innocent well-wisher. Perhaps because I was unfamiliar with the character, this part of the story lagged a little for me, but I think other comic fans will enjoy this �what if� scenario. The meat of this story is the emotional sledgehammer delivered by the Joker, and that�s ultimately swung for a final time when Catwoman eventually leaves Batman before their anticipated wedding. Interspersed throughout the buildup to the big finale are assorted Batman/Catwoman cover art by a treasure-trove of artists and what amount to love letters written by Batman and Catwoman to each other. These letters paired with the stunning artwork bring me to tears. The other highlight of BATMAN VOL. 7: THE WEDDING is the strange chat between Catwoman and the Joker as they lay possibly dying from wounds they�ve inflicted on each other. What seems like just a casual conversation between former colleagues becomes more disturbing as you begin to see the Joker�s insidious ramblings take root in Catwoman�s head. His chatter is worse for this superhero couple than any shot he fires from his gun. Learning that this was all some convoluted plan by my least favorite Batman villain Bane, is somewhat disappointing. I get that they think this will mentally destroy Batman and therefore destroy him physically eventually. However Machiavellian this plot was, the villains are all underestimating Batman. He might undergo a �Punisher-like phase� after this, and it will break his heart, but Batman and Bruce Wayne have proven their resiliency over the years, and I think he will eventually pull himself out of this mental and emotional tar pit he�s in now. I was especially disappointed by Catwoman and her underestimating Batman. In the end, Selina pulls a move typical of guys in romantic fiction � she pulls away from her lover �for his own good�, or for what reason she believes to be the greater good. The problem in these types of scenarios is that one character is taking away another character�s chance to choose and decide his or her own destiny. As somebody who loves independence and values autonomy, I think Selina will regret doing that more than anything else. I look forward to reading future Batman books to see if anything develops between these two characters one day, and to see how Batman copes. The big day approaches in these stories from Batman #38-44, from author Tom King (Mister Miracle) and artists Mikel Jan�n (Grayson), Jo�lle Jones (Supergirl: Being Super) and Travis Moore (Fables: The Wolf Among Us). Batman and Catwoman fighting side by side and so happy together - hooray! Written by generational talent Tom King and featuring art by Mikel Jan�n, BATMAN VOL. 7 features one of the biggest milestones in DC history! Collects BATMAN #45- 50. 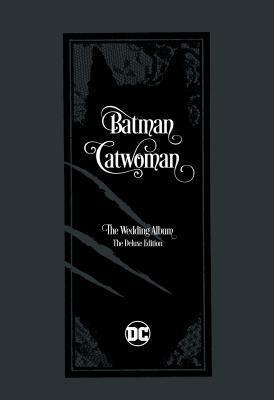 The historic wedding of Batman and Catwoman is commemorated in this must- have collector's item, featuring never-before-seen photos from the wedding album, behind-the- scenes design sketches and variant covers. Written by the critically acclaimed Tom King, this edition celebrates one of the biggest milestones in DC history and features art by superstar artists Mikel Jan�n, David Finch, Jo�lle Jones, Mitch Gerads, Lee Bermejo, Rafael Albuquerque, Neal Adams, Andy Kubert, Becky Cloonan, Ty Templeton, Jose Luis Garcia-Lopez, and more! Collects Robin vs. Ra's Al Ghul #1, Nightwing vs. Hush #1,Batgirl vs. The Riddler #1, Red Hood vs. Anarky #1 and Harley Quinn vs. The Joker #1.